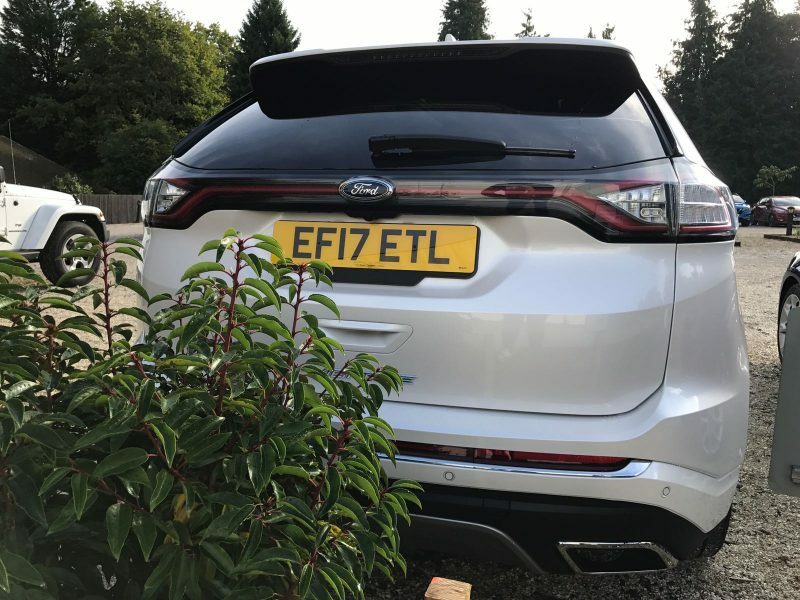 Home Reviews Ford Edge Vignale First Drive: Worth The Money? The Vignale range. It’s Ford sub-brand for models that offer more luxury and refinement. It’s a trim level that’s available on the Mondeo, the new Fiesta, Kuga, S-Max, and the model tested here – the Edge. It sounds like a good proposition, although I’ll be honest, I’ve never been fully convinced by the range. I personally feel that for the amount of money you’ll be paying out, you could get something German, something that is designed to premium from the very start. Sorry for the poor pun, I couldn’t resist… Anyway, on to the Edge Vignale. On first glance, it’s a big car, a very big car. For those of you that don’t know, the Edge is a product from our American cousins, and when you look at the vast dimensions, that is made very clear. The model tested is finished in Platinum White with massive chrome alloys, which look rather vulgar to me, but that’s all subjective of course. At least the paintwork is nice. Step inside this massive Yank and you are greeted leather almost everywhere. It’s certainly a nice place to sit and you will genuinely be impressed by the design, particularly the dashboard made purely of leather. The seats have a nice softness to them and I can feel myself sinking in to them as I gloss over the spec sheet. It’s definitely a nice cabin, but then it ought to be, as the spec sheet reveals that the car I’m sat in is over £45,000. Admittedly, that is with a few options added on, but even the base price is pushing £40,000 for the manual and £42,000 for the auto, and that is a lot of money for a Ford. Let’s put it this way, for that money you can have a range-topping Q5, although it’s worth mentioning that the Edge is noticeably cheaper than a BMW X5. You could also get a Range Rover Evoque with a decent spec for cheaper, although it won’t offer the same amount of room as the Edge. Hopefully you get where I’m coming from though, the Edge has entered the ring with the big boys. 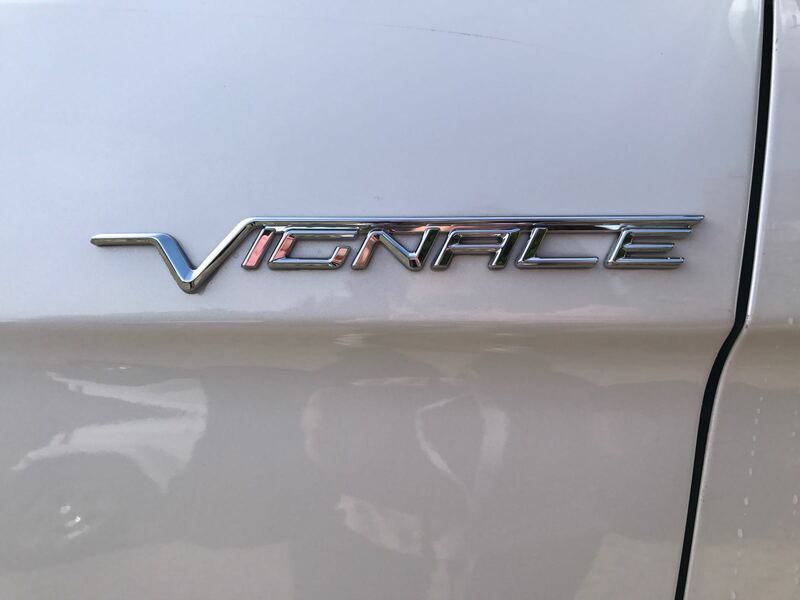 To be fair though, Vignale is more than just a bit of extra leather and fancy badge. What this trim level also offers buyers is a more personal buying experience, a concierge service, plus you’ll get unlimited free car washes. That last one isn’t a joke by the way, that’s the real deal. This does sound attractive, but will it be enough to draw people in? I’m not so sure. What Kit Do You Get? Well the price tag is definitely inflated, but thankfully you get a lot of toys for your hard earn cash. 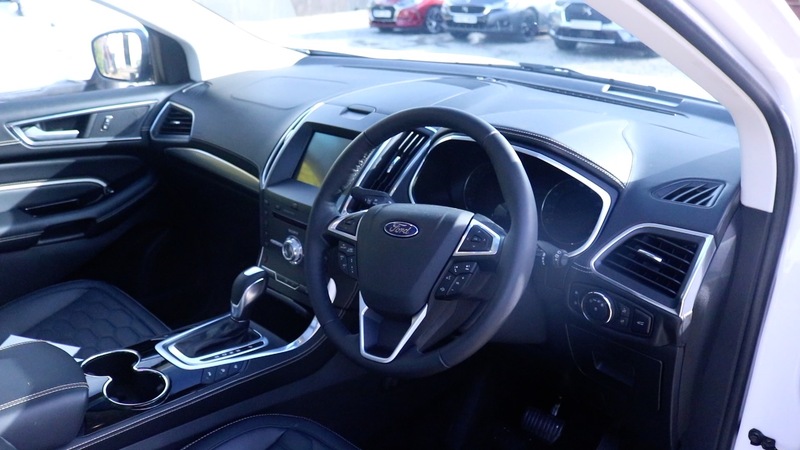 From the Edge Vignale you can expect standard features such as premium leather trim, 10-way adjustable driver’s and front passenger’s seat, heated front seats, Sony stereo and Sync 3 infotainment system, 20″ alloys, navigation and adaptive LED lighting to name a few. That’s on top features offered in lesser models such as front and rear parking sensors, handsfree power tailgate, auto-dimming rear view mirror, illuminated scuff plates, premium instrument cluster, climate control and chrome exterior features. The model tested had quite a few options though; (deep breath), White Platinum paint (£280), chrome door mirrors (£100), panoramic roof (£800), heated steering wheel, (£125), heated rear seats (£200), Inflatable rear seatbelts (£175), Active Steering (£475), Active Park Assist (£150), adaptive cruise control (£500), front wide-view camera (£150), and lastly, a detachable tow bar (£750). 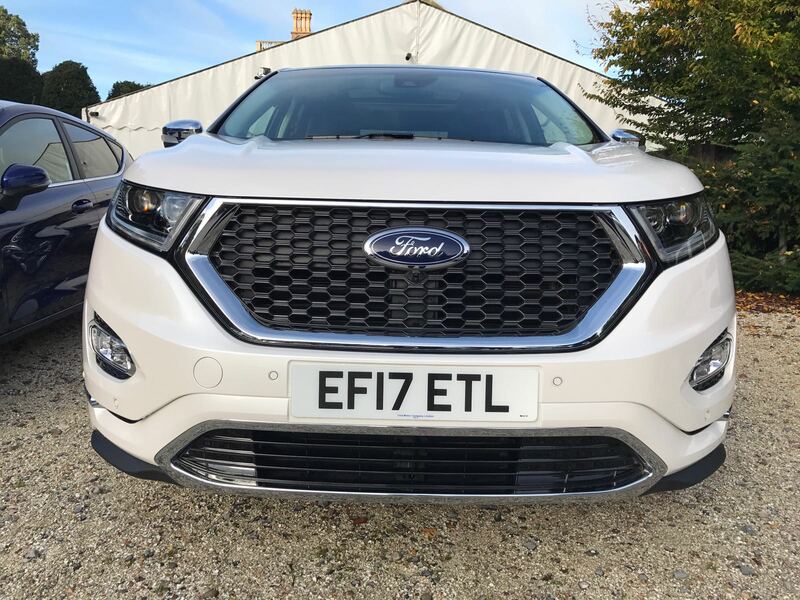 Two engines are available in the Edge Vignale, both of which are a 2.0 litre turbocharged diesel, but with different outputs – 178bhp and 207bhp. The former is mated to a 6-speed manual whilst the latter is mated to Ford’s Powershift automatic – both offer all-wheel drive capabilities. Both engines have the same 47.9mpg combined figure, so you’ll pay no penalty for getting the more powerful diesel although the performance difference is marginal. It also means you’ll need to make do with the automatic, which is not the best I’ve ever used. Trying to navigate the American-inspired Edge out of a tight car park quickly highlights the vastness of this SUV. Some SUVs are able to pull off a trick of feeling like a smaller car, but the Edge is not able to pull of the same trick, so if you live somewhere with narrow streets this may not be the car for you. The upside of such large dimensions is that there is plenty of space inside, no matter where you are sat. 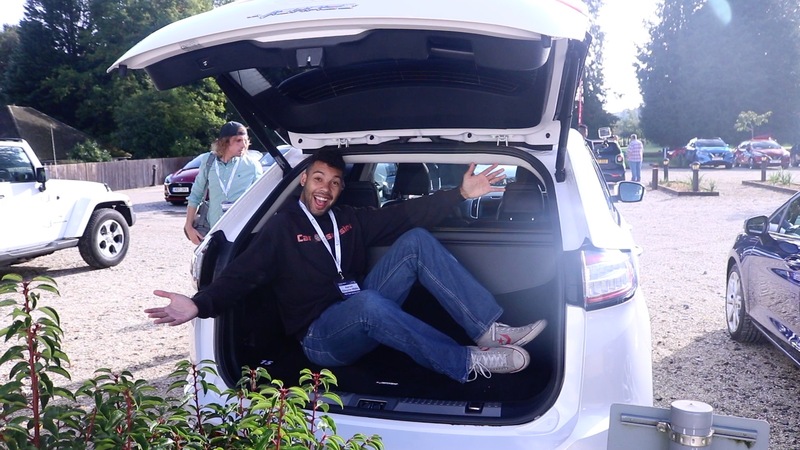 The boot is far from pokey too – you’ll get 602 litres with the rear seats up and a whopping 1,788 litres once the seats are down. The boot is THIS big! The diesel engine is smooth and refined, but you get a sense that it doesn’t really wanted to be rushed, which could be down to the automatic gearbox. It’s the same auto I had in the new Fiesta and it’s ok when you’re going about town, but it can be caught out once you hit faster roads. Like Fiesta, the changes are responsive and more acceptable if you take manual control of the steering wheel mounted paddles. The Edge then is more of a cruiser; it should be more than happy to eat up motorway miles for breakfast, and in plenty of comfort too. 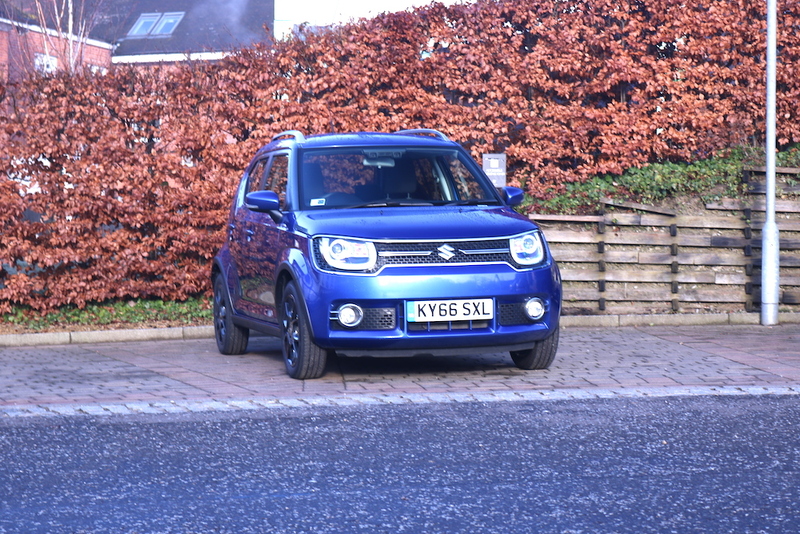 Although the Edge is a big car, you feel cocooned in the cabin as it’s quite a quiet place although the tyre noise from the blingy 20″ wheels is definitely audible. Other than that though, the inside of the Edge is a pleasant place to be plus the infotainment system and the dashboard is easy to navigate. In regards to handling, the Edge has the sort of body roll you would expect in a car of this size so it’s not going to be a car you enjoy threading through a medley of corners, although it felt more composed than I was expecting and the brakes and the steering have a nice feel to them. In fairness, it’s not actually that bad in the corners, but those looking for a dynamic SUV should definitely look elsewhere, but then again, the Edge is more about comfort and refinement anyway. 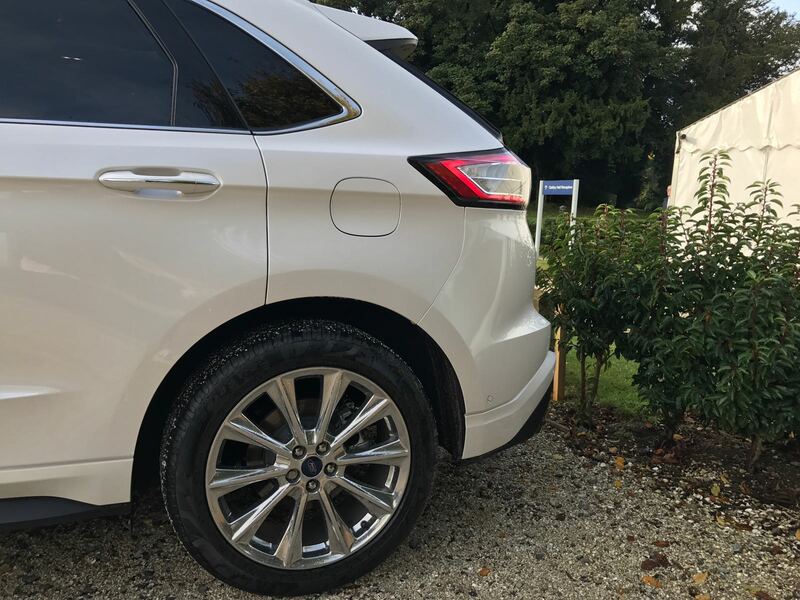 There are definitely some compelling reasons for choosing the Ford Edge and I understand what Ford is trying to do with the Vignale moniker. Despite this though, I still can’t get past the price tag. If you were paying this for a Beemer, an Audi or a Merc, you wouldn’t bat an eyelid, but for a Ford? I’m not sold. The Edge Vignale is bound to appeal for some buyers out there, but I’m afraid it’s not for me. 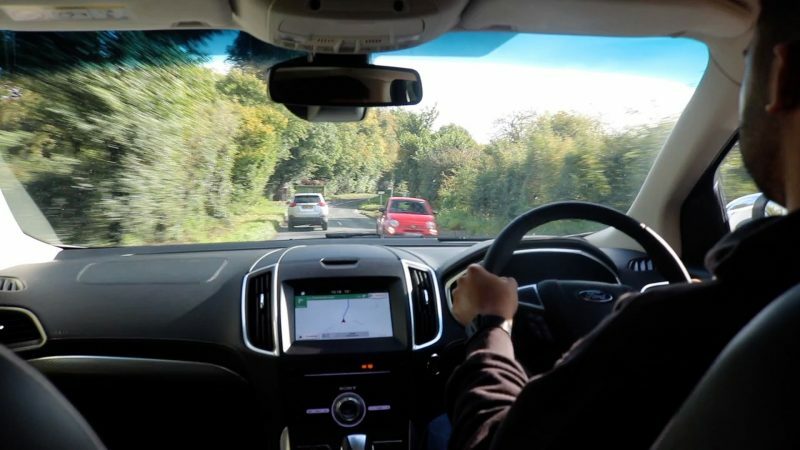 Ford has been well known for offering cars that offer good driving dynamics as well offering good value for money, so cars like this just feel a bit disjointed in Ford’s range. I commend the brand for trying to break out in to the premium market, but it’s stepped in to an arena where the competition is simply stronger and more polished. Next articleNissan Qashqai First Drive: Has The Best Got Better?